THE NUMBER ONE English <-> Yiddish PHRASEBOOK FOR ANDROID DEVICES! 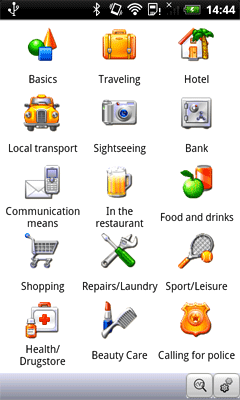 Ectaco Talking Phrasebook English <-> Yiddish for Android provides instant bi-directional translation of thousands of practical and useful phrases. It replaces bulky and inconvenient books and speaks all of its phrases aloud using clear, understandable native speaker voice narration for both languages. With it you will always be understood - even if you can't speak a word of another language. You can also purchase our software collections which have certain capabilities of the Ectaco Talking Phrasebook English <-> Yiddish for Android. These packages incorporate the best applications which have been brought together for you to get the terrific savings, as these programs would cost substantially more if purchased separately.